1) Mandating Religious Ideology: The twelve steps have connections to the Oxford Group, a Christian organization that was most popular during the 1930’s. Although there are positive aspects to the AA/NA communities, this is of concern. Especially when treatment is implemented involuntarily. Inmates who refuse or fail to carry out their treatment mandates will have their parole delayed by 30 days and will miss out on opportunities to transfer to lower security levels. Changing the twelve steps by substituting “higher power” where they used to say god does not change the fact that these programs are highly suggestive. While nothing is wrong with an individual practicing the religion of their choice, courts or prison administrations mandating programs that have ideology rooted in organized religion is a violation of rights. This is not much different than if church or any other religious service were made mandatory. Imposing ideology of a religious nature instills a value system in which people are urged to display obedience to an external authority. These principles are mirrored within society. Instead of taking control of their lives, people place their fate in the hands of a ruler. The concept of the first of the twelve steps is powerlessness, and this sets the tone for the entire program. 2) Undermining Prisoner Solidarity: While participating in prison treatment programs, inmates live in areas with others going through the same program. These units are referred to as therapeutic communities. There are many arbitrary rules and prisoners are encouraged to confront and report behaviors in others that has been deemed to be negative by the administration. Inmates are also pressured to inform on others in guided group interaction. Collective punishment and favoritism for informants are common and highly effective control tactics implemented. Constant threat of program failure resulting in loss of parole time, work release or a reduction in security level is used to apply additional pressure and promote inmates giving up information on each other. This causes an environment of distrust among prisoners and essentially creates an inmate population that polices itself. As a result it is very difficult for prisoners in a unit to organize any resistance or express criticisms of the prison staff or program. Those who do not give up information under pressure are said to be “upholding the criminal code” or “conspiring with negative behavior.” It is effective in creating a population of scared, competing individuals rather than a group of inmates with a sense of unity. Prisons, especially treatment units deliberately create environments that won’t allow prisoner solidarity to develop. This leaves inmates with options of being informants and collaborators with prison administrators or taking part of prison politics, which divides incarcerated people by race and gang affiliation. Neither snitch culture nor prison culture is a solution. Inmates need to realize that their power is in their numbers and prisoner solidarity is the only means by which a resistance can be carried out against the prison industrial complex. 3) Surveillance/Information Gathering: Treatment counselors working in prisons are mandated reporters. This means that they are required to report any crime that they have knowledge of. Inmates are asked extensively what kind of crime they are involved in during group sessions as well as in mandatory treatment workbooks. Refusing to answer questions would be considered to be uncooperative and could result in program failure. Counselors also take notes during group sessions about a variety of sensitive topics. Information regarding drug of choice, affiliation to any organizations deemed to be security threat groups and any other details administration finds to be relevant is gathered. This information is added to the file of each prisoner and is later used to aid law enforcement in future cases or by officers working on various supervised release programs. Conflicts between prisoners that could be resolved without intervention by officials often results in disciplinary consequences for one or all those involved. Incarcerated people should be cautious about the information they provide on themselves. Also, this can be used as an opportunity, to provide disinformation to confuse or guide law enforcement in the wrong direction. 4) Internalizing Oppression: There is an emphasis on personal responsibility in treatment programs within the prison system. Although this appears to be a positive lesson, the actual purpose of this is to place firmly in the minds of all who pass through these programs that they are they are in the wrong and the system is in the right, that those found to be in violation of the law are diseased degenerates or lack the morality to function within society. This is not to say that individuals are not responsible for their own actions. The problem is that there is no room to question the social and economic factors that make poor people and people of color far more likely to enter the prison system. Looking at the macro scale functioning of society is discouraged. This creates a negative self-image and also prevents inmates from educating themselves and others about the way that our current society really works. I see this approach as extremely harmful, as it implies to incarcerated people that they are the sole cause of their painful situation. The root causes of crime and the incarceration rate must be identified as capitalism and white supremacy. Instead of insisting to punish the casualties of an unjust society, we should be looking to change the conditions so that individuals no longer have to commit crimes to meet their needs. 5) Maintaining Rehabilitative Image: The number of jails and prisons is only increasing. Calls for reform are becoming more common. People are beginning to recognize that prisons serve little more purpose than to warehouse the casualties of an unjust society. A very high number of inmates are incarcerated for the possession or sale of drugs. Many thefts and robberies are attributed to drug users. This is a largely stereotypical and inaccurate view, because it is not drug addicts to steal, but poor people. Rich white suburban and professional drug addicts do not steal. It is predominantly poor and working class drug users of color who are put in positions where there is any need to steal. Treatment programs allow for the argument that prisons provide rehabilitation for the individuals who pose a threat to public safety. This explanation for crime keeps the discussion away from the social conditions that drive up the crime rate. It is an avoidance tactic that serves to divert us from questioning the legitimacy of the legal system itself and its purpose within capitalism and the state. With a closer look, the assumptions that crime are a result of immoral or diseased people, that prisons jails and law enforcement exist to protect innocent civilians from these people, and that through caging these people we can somehow rehabilitate them prove to be extremely simplistic and inaccurate. We should be adopting a mind state in which we are looking to do away with the elements of society that create a need for prisons. Recidivism rates refute the claims that prisons are rehabilitative. The criminal justice system is punitive, when it should be preventative. External policing of entire neighborhoods does not prevent crime. Only meeting the needs of the people and building security directly through communities can prevent crime. I have no judgments against self-identified drug addicts who voluntarily participate the in AA/NA programs ran by inmates that exist in every prison facility. It is commendable for individuals put in the work to overcome their substance abuse problems. I also have doubts about the effectiveness of drug treatment if it is not a voluntary, intrinsically motivated undertaking. If these groups exist, what is the need for another separate, staff run, regimented, high stress, coercive program? 12 step programs are now really nothing more than a branch of the prison industrial complex. My thought is that inpatient treatment programs within prisons are less about the well being of inmates struggling with their drug use. It seems that the main purpose of the treatment programs within the department of corrections is to serve the functions mentioned above. Prison treatment counselors are nothing more than specialized type of corrections officer. Prison treatment programs are a tool of the prison industrial complex used to push an ideology that legitimizes the slavery and brutality that is mass incarceration. "Prisons play a greater role in society than just warehousing people for social control and profit. [They] also . .. carry out psychological violence . . . to legitimize state violence imposed on incarcerated people by backing it with moral and intellectual authority. . . ."
We are all incarcerated and the rich don't need to steal to buy drugs to dull the horrors of living in a society they want to perpetuate to go on buying drugs to stupefy themselves against capitalism. NA was appropriated by capital a long time ago. Enforced attendance and the exploitation of the program by profit focused treatment centres have had a very negative effect on the already naturally low success rate of NA. NA works for a significant minority of voluntary attendees but it is not a guaranteed success for everyone that wants to clean up. The 'service' structure' of NA are the unpaid lackeys of the World Service Office which is a global corporation whose business model would have the CEO's of any business drooling at the mouth. They stole the copyright from the fellowship and produce literature and other merch which they sell to groups at inflated prices. Any funds that the groups have left are donated to area service which makes it way up the service hierarchy until it reaches the coffers of the WSO. Of course, the literature is sold at a discount to other profit making organisations. There are a few groups in the UK and the States that operate outside of the service structure, print their own literature and are truly autonomous in the spirit of the NA Traditions. Needless to say, directives have been distributed and lies have been spread but a pure message is still there for the few lucky enough to find it. Elsewhere, a diluted, wishy washy experience is available - still better than nothing I'd say. 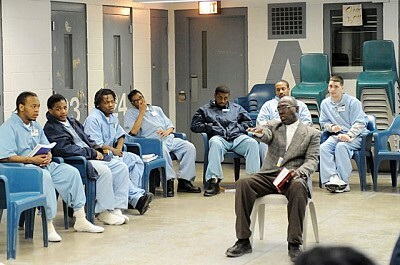 As for prisons, if attendance is truly voluntary, then I would say meetings behind bars are a good thing. I know of people that failed to get clean in prison, but the seed having been sown have sought recovery on release. Some groups practice hospitals and institutions outreach with varying results. This can often seem a waste of time but you never know when a success may come and it's always good for those doing the work.